The social media gurus among us know that Saturdays have permanently been renamed Caturday, but did you know that October 29th is National Cat Day? Yes, it’s true, this entire weekend is all about the cats. According to NationalDayCalendar.com, National Cat Day was founded to help the public recognize the number of cats that need to be rescued. It’s also a day for cat lovers to celebrate the cats in their lives for the unconditional love and companionship that they give. Though the kittens in our lives aren’t always the most expressive, we think today is a great day to show them just how much we love them. Here are five ways you can show your cat how much you appreciate him/her. Anyone who’s ever owned a cat knows that cats go crazy for catnip. This harmless herb gives our feline friends a pick-me-up and enjoyable “high.” Combine catnip with a special toy and you’ve really ramped up the fun for your pet. Or, if you want something more permanent, plant an indoor or outdoor catnip garden so your feline can have a nip every now and then. Cats will love you back when you shower them with catnip. Cats love to watch birds. They also probably wish they could pounce on those birds. Thank your cat for being her sassy self by putting up a bird feeder or bath where your kitty can watch in the window. This way she gets all the enjoyment of bird watching and none of the gore. While cats aren’t known to be as affectionate as their canine counterparts, they still appreciate some loving from their furless pals. Simply stroking your cat, gives an all-over feel-good experience that lowers his blood pressure —your blood pressure will also go down as an added benefit. Pay special attention to the places he likes best, such as the base of the tail and under the cheeks. Touching, petting, and massaging your cat also serve as well-cat checks to find any fur mats, lumps or bumps or sores that need medical attention. Sometimes you kitty may want to give into her wild side and go for a romp outside. She may sit at the window and dream of going on a hunt, but you know it’s not safe, so what do you do? Get your kitty a outside play enclosure as a way of saying thanks for putting up with the required monthly bath. 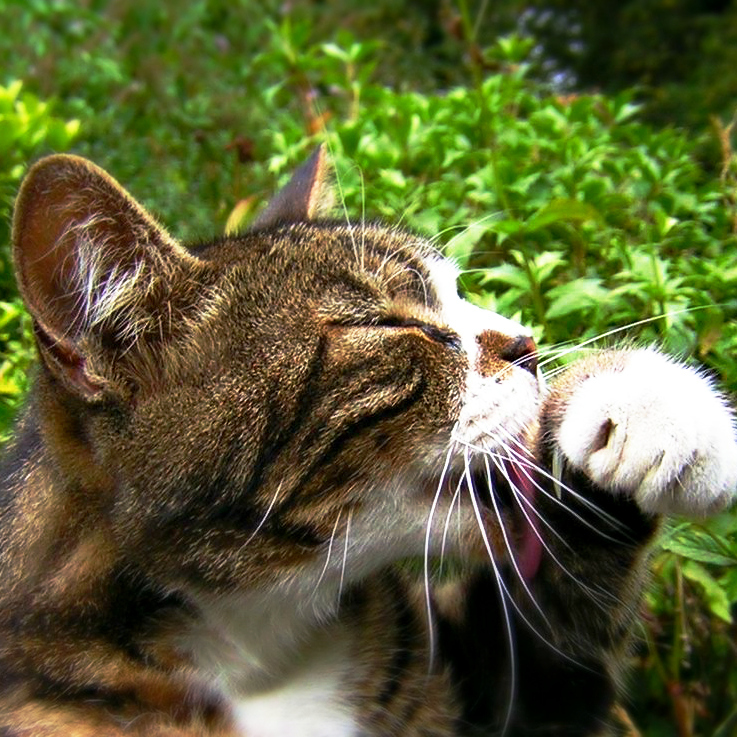 Cats spend half of their waking hours self-grooming. What can we say, cats like to stay spiffy, they also like to groom their friends as a sign of affection. Not only does the comb/brush feel like an all-over massage, it keeps fur mat-free and skin clean, reduces fur-balls, and enhances the bond between you and the cat. If you really want to amp up the bonding opportunity you can try licking your cat during the grooming session. Don’t worry, we don’t mean literally, but there is a cat brush that is made to simulate a cat tongue — if you’re into that kind of thing.